These two foods might look quite similar. The background color, carb color (rice and shortcake are both brown), and star food color all are very similar. There are however some very big differences in these foods. One can kill some people with those little shellfish and the other is delicious to all. Why would you ever choose shrimp over the strawberry shortcake? That is the opinion of my fiancee who is allergic to shell fish. I, on the other hand happen to think these two dishes make a perfect summer meal. Not just any meal. This is the perfect menu for a summer dinner party. The shrimp is sweet but with a little bit of HEAT. Don’t worry this isn’t anything that a little beer can’t fix. I definitely recommend having a bucket of your favorite cold ones for this dinner party. Every gathering requires a dessert. What’s a dinner party without dessert? Not a party that I would host. Strawberry shortcake is the perfect ending to this meal. If strawberries aren’t still in season, you can use blueberries, blackberries or even peaches in their place. Shortcake with berries and whipped cream is a dessert that anyone will enjoy. In my case it is the only one that my fiance will enjoy. In a sauce pan, melt butter over low heat. Add sugar, tomato paste, vinegar, hot sauce, red pepper flakes, lemon juice, salt and garlic. Stir and cook for 3 minutes, then remove from heat. Reserve 1/4 cup of the sauce to later cook the shrimp in. In a sealable bag, add shrimp and marinade. Marinate 20 minutes. Meanwhile, you can make the rice. To a large heavy bottomed pot, add the stock, salt, butter, lemon zest and pepper. Bring to a boil. Add rice. Reduce heat to low and let simmer. Cover and simmer for 20 minutes. After 20 minutes, remove from heat. Stir. Cover the top of the pan with a clean dish towel for 10 minutes. While rice is sitting, you can cook your shrimp. In a large skillet, melt 3 tablespoons of butter over medium heat. Add onions, and red and orange peppers. Cook over medium heat, stirring frequently, for 3 to 4 minutes. Add the reserved 1/4 cup of marinade to skillet. 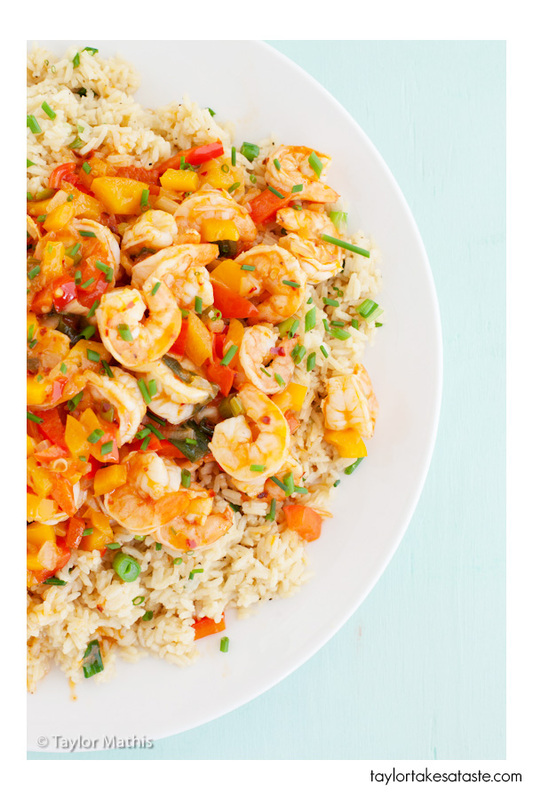 Remove shrimp from the refrigerator and drain away marinade. Add shrimp to the skillet. Stir and cook until shrimp are no longer opaque and have a nice white color. Turn off heat. Remove towel form the pot of rice. Fluff the rice and stir in the 1/2 cup of chopped scallions. Place a bed of rice over a large platter. Top with shrimp and sauce mixture and serve. In a small bowl, combine 3 cups of chopped strawberries, sugar and lemon juice. With a fork or pastry blender, mash berries. Pour mashed berry mixture over remaining 5 cups of strawberries. Reserve. In a medium bowl, place the heavy whipping cream, powdered sugar, salt and vanilla extract. Beat with a mixer or whisk until cream forms soft peaks. Let chill in the refrigerator. In the bowl of a food processor, combine all-purpose flour, baking powder, salt and sugar. Pulse a few times to blend together. Add butter pieces. Pulse until the flour has a coarse and mealy texture. In a separate bowl, mix the egg, heavy cream, honey and almond extract. Pour cream mixture into processor bowl. Pulse on and off until the flour and cream mixtures combine to form a dough. Turn dough out onto a floured surface and knead 2 or 3 times. Roll dough out into a 3/4-inch-thick layer. Cut out 8 to 10 rounds with a biscuit cutter. Place rounds on a silicone-lined baking sheet and wash the tops of the shortbread with cream. Bake at 375°F for 15-18 minutes until light golden brown. Let cool. 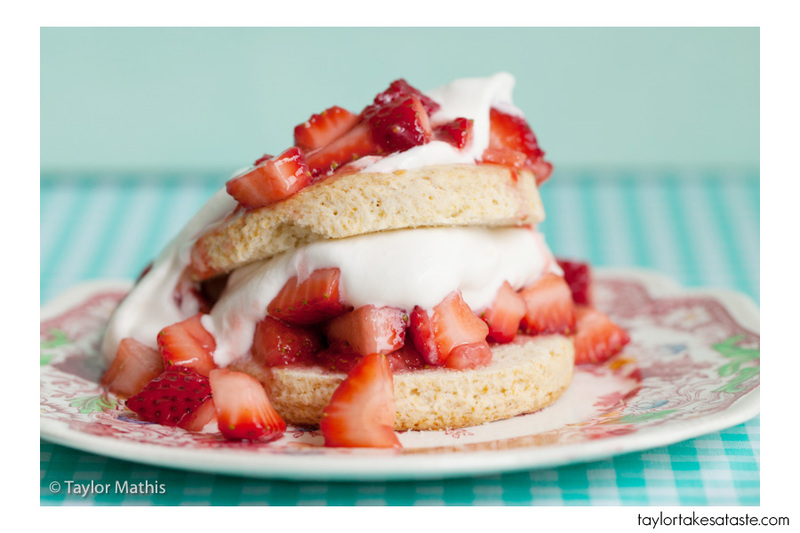 Once the shortcakes have cooled, cut them in half. Place the bottom half on a plate and add a layer of strawberries followed by a layer of whipped cream. Place the top half of the shortcake on top of the whipped cream. Top the short cake with more berries and whipped cream. 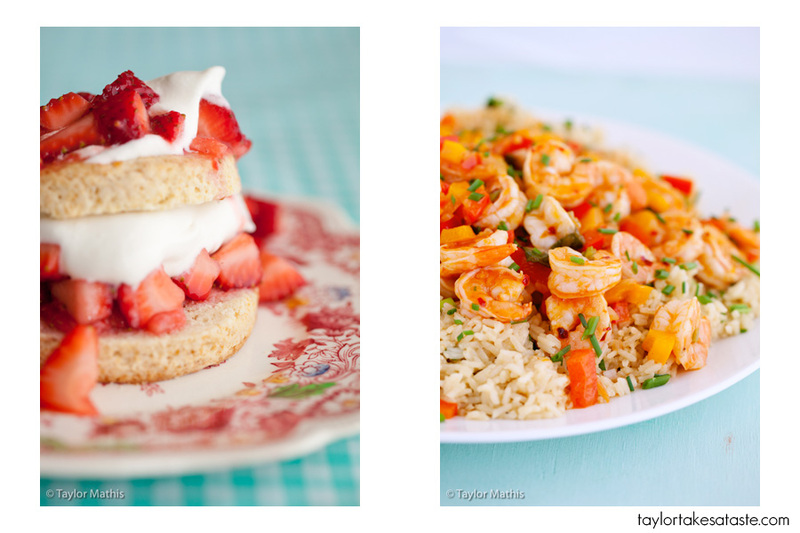 These were both recipes that my Mom and I developed for the Go Bold with Butter Blog. I meant to say ‘portion’ not version. My comment doesn’t make sense up there, sorry. This is just proof that life is not fair. Although I am not allergic to shellfish, I am sensitive to soy. What up with all the allergies nowadays? I am learning to work around it, but I don’t like it. I don’t think any of my friends are sensitive to this so this is going to be my next gathering. Your photos are beautiful. I find browns and oranges difficult to photograph. I am going to try to emulate your work. I’m still waiting on that Atlanta or Charleston workshop! Don’t be getting all wedding busy now and forget about us folks who need some education!